Uber comments on digging up dirt on journalists: When funding makes a tech company dangerously aggressive. Uber Keeps Acting Like It’s Invincible. What If It’s Not? Over dinner, [Michael] outlined the notion of spending “a million dollars” to hire four top opposition researchers and four journalists. That team could, he said, help Uber fight back against the press—they’d look into “your personal lives, your families,” and give the media a taste of its own medicine. Michael told BuzzFeed in a statement that he regretted his comments and they “do not reflect my actual views and have no relation to the company’s views or approach.” Uber added that it does not conduct opposition research on journalists and has not considered doing so. Early Tuesday morning, Michael reiterated his apology publicly on Twitter. Lacy, for her part, has written a full response to Michael’s reported comments in which she calls Uber out for running a campaign “that’s looking more like a pathetic version of House of Cards than a real campaign run by a real political professional,” a reference to the company’s recent hiring of former Barack Obama adviser David Plouffe. As a journalist who covers Uber, at times critically, I was concerned by Smith’s report. More than that, though, I was confused. It’s true that Uber has gotten plenty of bad press recently. But in terms of the numbers alone, Uber is still far and away the dominant player in the on-demand ride-services game. The company already has more than $1 billion in funding for a $17 billion valuation, and reportedly is looking to raise $1 billion more. Lyft, arguably its biggest competitor, has slightly more than $300 million in funding for a $700 million valuation. Uber operates in more than 200 cities and 46 countries; Lyft is in closer to 60 cities in the U.S. and has no presence abroad. Uber, in other words, is already in a different league than that of its competitors. It has money that they don’t and millions of users serviced by hundreds of thousands of drivers around the globe. By one estimate, Uber’s revenue is 12 times the size of Lyft’s and increasing 10 to 11 times as fast. In its industry, Uber is just about as secure as it gets. It shouldn’t need to consider funding oppo research against disapproving journalists. But here’s what else is true: The market for ride-sharing, or on-demand car services, or whatever you want to call them, is a tricky one. Uber, Lyft, Gett, Sidecar, and the other companies in this space are all relatively young and haven’t had time to develop any particular customer loyalty. And from a rider’s perspective, it’s easy to download a new app and start using it if you’re dissatisfied with the service you were using. The same is true for drivers. 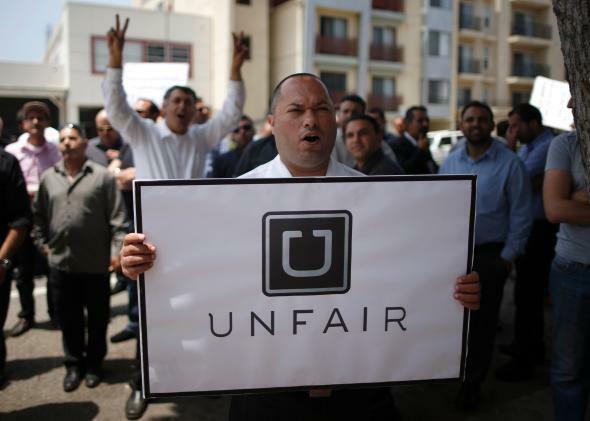 As independent contractors, the drivers who make these ride companies viable aren’t tied to any particular platform. If Uber is paying more, they’ll drive for Uber. If Lyft or Gett offers better prospects, they’ll head that way. The point is that Uber—and Lyft, and Gett, and every other company like this—constantly risks losing the people on both sides of its platform. If it treats drivers poorly, as some say it already has, it could push those workers away from its service. And if it hits a nerve with customers—say with an apparently sexist promotion, a tone-deaf blog post about teachers, or a threat against journalists—it could see them go elsewhere as well. Right now, Uber’s lead on its competitors is so big, it seems like it would be best off keeping its head down and steering clear of unnecessary controversy. And yet, so far, that hasn’t been the case. Maybe Uber is a little drunk off its own success. Maybe it thinks the numbers make it invincible—and maybe it’s right. Even so, with each added controversy, Uber is risking, however slightly, alienating the people that make its platform possible. Drivers are already on edge. Riders might be getting there. And billions of dollars in funding be damned, Uber hasn’t got anything without them.